Hat tip: Ed Jeter @eddissimo on twitter who informed me that composer George Frederick Handel's 331st birthday would be on Tuesday, Feb 23, 2016. The great German born [who became a British citizen] Baroque composer, George Frederick Handel, was born 331 years ago on Feb. 23, 1685. Of course, the quintessential Baroque composer, Johann Sebastian Bach is recognized by most as the greatest Baroque composer, and maybe the greatest composer of all. 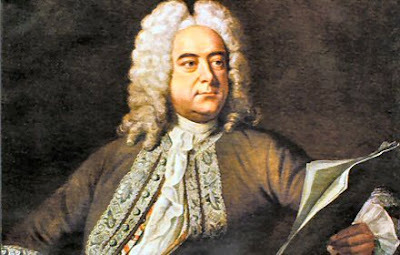 I think Handel might popularly be considered the number two composer in the Baroque Era of music. This from the Handel Biography web site: "Baroque composer George Handel was born February 23, 1685, in Halle, Germany. In 1704 Handel made his debut as an opera composer with Almira." "In 1726 Handel decided to make London his home permanently, and became a British citizen." "He produced several operas with the Royal Academy of Music before forming the New Royal Academy of Music in 1727. When Italian operas fell out of fashion, he started composing oratorios, including Messiah. George Handel died April 14, 1759, in London, England." "In addition to his oratorios, Handel’s concerti grossi, anthems and orchestral pieces also garnered him fame and success. Among the most noted were Water Music (1717), Coronation Anthems (1727), Trio Sonatas op. 2 (1722–1733), Trio Sonatas op. 5 (1739), Concerto Grosso op. 6 (1739) and Music for Royal Fireworks, completed a decade before his death." Handel's most famous piece is undoubtedly his oratorio, "The Messiah, a popular piece that is played usually during the Easter and Christmas holidays in concert halls everywhere. You don't have to be a Christian to recognize the greatness of this stirring music. When the Hallelujah Chorus comes on, the audience in the concert halls rise in unison. Happy Birthday, George Frederick Handel! Thank You for the wonderful music you have given us!